or maybe just some cute St Patty's Day Cards! How are you doing? It's been a minute! Life is CRAZY.... Today I am over on the Kadoodle Bug Blog and Fan page with this project. I am obsessed with Nuvo Drops. I only have like 10 more to go and I will have all of them! I am also obsessed with the Embellishment Mousse, not exactly sure what I'm suppose to do with it so I'm just winging it! So I made this card and I am in love with it. 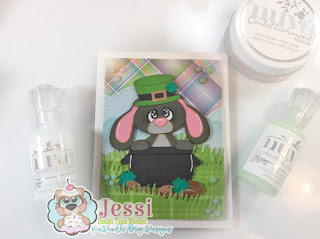 I used the embellishment mousse in cosmic brown to color the coins and his bucket for his hat. I cut three pieces of pattern paper out of the cross stitched rectangles. Then cut grass and clouds out of them! i love how it turned out. I used Lawn Fawns watercolor petite pad and the perfectly plaid rainbow pad. Below are links to all the products. Make sure to stop over on the Kadoodle Bug Page to give some love too!